For a long while I’ve been “dying to play” with Selenium (www.seleniumhq.org and code.google.com/p/selenium/). I’ve heard and read very good things about this tool from colleagues and from the blogosphere. Selenium is, in short, an open source tool to automate web browser interactions. A primary use case is, of course, browser test automation. Selenium has greatly evolved with time, specially since the 2.0 release when the legacy Selenium project merged with Google’s WebDriver. Nowadays, Selenium offers a wide range of programming languages supported to write the tests, an impressive browser compatibility list, the ability to record tests from user interactions and, above it all in my opinion, the ability to re-execute tests across a grid of machines with various operating systems, browser families and versions. Although Selenium seems to be primarily chosen for functional/regression test automation, it’s also a great choice – precisely because of the grid feature – for cross-browser compatibility testing: ensuring in an easy, cost-effective way, that our web applications are usable in all sorts of operating systems and browsers. In this and forthcoming posts in a short series I will share my experiences setting up a Selenium Grid, building some automated tests for a simple Spring application, re-executing them from Eclipse IDE and finally re-executing them in continuous integration (including code coverage) with Maven, Cargo, Jenkins, Sonar and JaCoCo. First of all I wanted to start by building the grid: a number of virtual machines with different operating systems and browsers ready to be used to re-execute Selenium tests. Yes, you can re-execute the tests locally but then it would be limited to your OS and the browsers installed in your PC. Thinking on mid-to-large projects, it makes more sense to have some spare capacities that can be shared across developers, with a wider coverage of OS-browser mixes. Selenium Slave1. Windows XP 32-bit box, 1 GB RAM. This box has IE 8 and Chrome 16 browsers installed on it and will act as a node for test execution. Selenium Slave2. Ubuntu 11.10 32-bit box, 1 GB RAM. This box has Firefox 9 and Opera 11.61 browsers installed on it and will act as a node for test execution. Selenium Hub. Ubuntu 11.10 32-bit box, 1 GB RAM. This box will act as the hub, the controller of the grid. Once I installed all chosen browsers, I downloaded the Selenium Server component from their website, exactly the file selenium-server-standalone-2.16.1.jar, and saved it in a handy place, as c:\selenium-2.16.1 or $HOME/selenium-2.16.1. I also downloaded and installed JDK 7 update 2 32-bit in each box. For the Windows box I also needed to download the chromedriver component. chromedriver is a standalone executable needed to automate interactions with Google’s browser that is developed separately in another project hosted in Google Code here: code.google.com/p/chromedriver/. I downloaded the latest release at chromedriver_win_18.0.1022.0.zip and extracted it under c:\selenium-2.16.1 as well. Finally I added c:\selenium-2.16.1 to the box PATH (it should be accessible to the server process). Once the three boxes were ready, I launched the hub process. Our tests will interact with the hub, asking for available capabilities in a certain OS, browser and version. The different nodes (even the hub itself if it has spare capacity and browsers available) will register with this hub and will be available for future test executions. Capabilities can be optimized for parallel processing, for example 5 Chrome browsers, 2 Firefox browsers on some box and 2 Safari browsers on some other. The port parameter is optional and actually 4444 is the default port for the hub role. After a few seconds, the process will start the daemon and will wait for the nodes to register and tests to come. For the nodes, the process is quite similar but you will need to pass the hub URL and what browsers are available. The port parameter is again optional and 5555 is the default port for the node role. Note how the browser parameter is used (more than once if needed) to tell the hub about the available browsers. Note as well that you may need to ‘escape’ the browser string value if there are spaces. Also noteworthy, you may add version information but it is not required. In my opinion IE version is really critical for cross-browser matters but in other browsers it is not so important. And that’s all. We’re done setting up the grid! In this post I’ve discussed a bit about Selenium and shown how easy is to set up a grid for test execution with Selenium Grid. In part 2 (read it here) I will explore Selenium WebDriver for writing and launching web UI automated tests. Hi, what’s “-role wd”? Can it be a typo? Also to consider: is the hub registered at port 5556? Default hub port is 5555.
regarding the registring of port ..could u please elaborate on that..
To be honest I’ve not used the old Selenium 1 role names, only the Selenium 2 roles that are ‘hub’ and ‘node’. According to Selenium 2.25.0 source code I can see that old aliases are still accepted (rc, wd, remotecontrol, remote-control and webdriver) and are equivalent, so there is no practical difference if you register a node with ‘-role node’ or with ‘-role wd’. However I suggest using only Selenium 2 roles: ‘hub’ for the Grid hub and ‘node’ for each of the Grid nodes. Re the registration of port, forget about that: it should not be an issue if you register the node in port 5556 instead of the default one (unless a firewall blocks it, but that’s a different issue). Another question, to try to better understand the issue: what do you mean with ‘seen in console’ or ‘not seen’? Do you receive any error message when launching the second node? What does the Grid console shows? now when i open my grid console on http://localhost:4444/grid/console i see my windows node spawned (Chrome and IE seen) but linux part of it is not. On the GRrid command i see Warning:Max instance not specified Using Default = 1 instance. Step 1. Execute hub on host windows xp. Step 2. Execute node on host windows xp. Step 3. Execute node on virtual linux. when I register the Mac node with the hub on windows it does work but the hub displays the always the default browsers and I cannot test against safari and opera, even if I specify in my json config file that I want one FireFox it still shows the default 5 firefoxes, 5 chromes and 1 IE. Any idea what might be the reason ? if I set up another node on windows and modify the above config to ron only one instance of Firefox, the change is reflected in the hub console but no changes applied on the mac node are reflected. I have no idea why. Hi. Sadly I don’t have a Max or have worked with them so I can’t tell. It should be the same being a Java program but it is really weird that your config on a Windows node is understood and not in Mac. Regarding environment variables, nothing esoteric; PATH should point to the place where native drivers can be found, i.e. ChromeDriver, but nothing else. Anyway, this is for runtime, and I can’t tell why the config is not properly loaded in the Mac node. Hey I managed to make it work. I have used Json file config. But even with json it didn’t work first but fortunately guys on freenode irc spoted that apparently the value of the platform variable should be in quotation marks. So instead of platform = MAC it should be platform = “MAC”. The reason it was hard to solve was because there was no message that there was error in the config and the config was just ignored and default one was used instead. There is still problem with safari brawser and I am not sure why. Have you tried removing the escape char (‘\’) at the end of the hub location? I’d have thought that would be a possible problem. Is it possible to run test from a remote machine. For example: my local machine is having Selenium code and Selenium standalone server is running on this machine. I have defined it as a hub. Also I have created a node. Now if I try to hit http://:8080/ from a remote machine and initiate the test, it’s opening the browser in the Local machine and not in the test machine. Can you please suggest how to run and view tests running on remote machine? – The box launching the test needs to connect to the box hosting the hub. – The hub and nodes need to connect between themselves (node to hub when registering, hub to node when executing a test). – The nodes need to have access to the application under test. – Pay attention to IP addresses and ports, specially when working behind proxies or with NAT. The test script should refer to the grid hub using the IP addr/port that is accessible from the box running the test, the hub should be listening to that addr/port (i.e. a box with multiple network adapters), and the test script should refer to the application under test using the IP addr/port that is accessible from nodes (not necessarily the same that is accessible from hub or from box running the tests). If you follow these simple rules, you should not have any major issue. QQ – Can the use of Jenkins and the Hub be on the same box? with the Nodes on two other boxes? Or should the Hub be separate from Jenkins? In terms of Jenkins configuration, would you not use the plugins for Selenium? (i.e Create Selenium RC instance or SeleniumHQ htmlSuite Run? There are no issues having Jenkins and Selenium Hub running on the same box. Indeed you can use Jenkins plug-in but if you have a standalone hub running you may use it while building from Jenkins and from developer’s IDEs (thus all the team can share the same grid of testing nodes). ok, I was able to get the hub running on that machine, and 2 nodes registered into it. But I’m a bit confused as to what I need to configure on Jenkins end. If I say try to kick off the hub in Jenkins, it just runs and nothing ever happens. not that this is related, but I’m also using python and perforce. Do I need Maven and/or Ant installed to configure this? Hi, Do you have any info on configuring the switch of the remote driver and local? what do you mean by “static in my code”? if you meant application code, Selenium does not care, as it interacts directly with the browser. of course if the application is not well built and those statics lead to concurrency or other bugs, the tests may be able to detect the situation. yours and myy visitors would definitely benefit from some of the information you present here. Yeah why not? Cross linking other blogs is always a good idea to spread knowledge! I started to use selenium grid 2 for my testing. There are several arguments available when running the grid server, e.g. “java -jar selenium-server-standalone-2.35.0.jar -role hub -maxSession …” My question is that if there is any document/example to detail the usage on applying these arguments (I know with “-h”, there will be some information returned)? Also, can these arguments be applied to both “hub” and “webdriver node”? A good approach followed by many is to rely on external config files (Yml format) instead of using long command lines. I liked your blogpost for the selenium grid. 1. 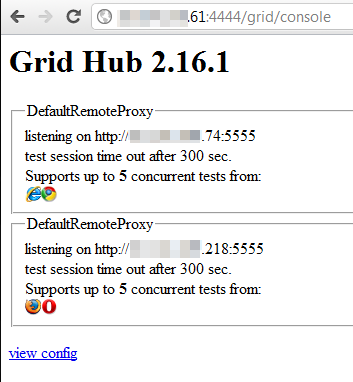 Please can you let me know, all the selenium testcases using GRID will run making use of the hub deployed application or deployment will happen on all the hub and nodes. If we make use of single deployment and run the selenium testcases, for example in our test cases we will make use of database reset (seed data) for beginning of every test case. In that case How the selenium testcases run? When we are running selenium testcases through GRID, we will deploy application on hub machine and then we will make use of that application URL to run on all other node. If we do so, we have totally independent testcases written and at the beginning of every testcase we will reset our database. how the selenium test will run? your approach is fine if only one test suite is executed at a time, but if you run multiple test suites or just choose a framework that executes test cases in parallel, you may find that your tests collide (they share the same data store). options are multiple: use different db schemas, embedded db runtimes (derby, h2)… and provide each executing test its own env to run. did you check part 2? is it possible to run with that xml suit file. Hi, I am trying to automate the testing on a STB having TnT browser. Selenium does not have webdriver for TNT browser. How do I go about!.